Let’s start off with my recommendation anent Against All Things Ending: If you have read Stephen R. Donaldson and loathe him (and there are a few) then this book will not cure you of that malady. In fact it will probably solidify your animus against the author. 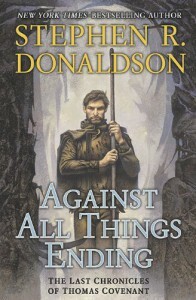 If you’ve never read Donaldson but have heard of him and are curious, this is still not the book for you. Start with the original Chronicles, the Gap series or Mordant’s Need, all of which show off Donaldson’s talents at their best. If, like me, you think Donaldson is a brilliant and important writer than you’ll have to read this book despite its flaws. And there are flaws; the greatest of which is length. A hundred, two hundred pages could have been shaved off easily without detracting from the emotional impacts of Linden’s and Covenant’s dilemmas and actions. The second thing that makes it difficult to persevere in reading is Linden Avery. Other reviews have mentioned how unlikeable she is and it’s true. You would have thought that after the end of the Second Chronicles, Linden’s self-image and self-confidence would be greater but here she’s even more selfish, terrified and willfully stupid. In Fatal Revenant, Linden tore Covenant’s spirit from the Arch of Time and reincarnated him so that he could save the Land while she focused on saving her son, Jeremiah, and in the process woke the Worm of the World’s End, precipitating armageddon. In Against All Things Ending, Linden’s obsession continues to extract a horrible price from everyone around her. Galt, who turns out to be Stave’s son, dies defending Jeremiah. Liand dies trying to bring Jeremiah out of his mental fugue. And Elena, the long-suffering daughter of Covenant and Lena, is sacrificed to She Who Must Not Be Named in one of the most shocking and emotionally disturbing scenes in the book. And her other companions suffer nearly as much - Haruchai, Swordmainnir and Ramen. Covenant, at least, appears to have learned something from his experiences. He can still be frustratingly passive beyond all reason but he exhibits some remorse for his actions and their consequences and takes pains to minimize them. All that aside, my objections are to the surfeit of details and the feeling that Donaldson is beating me over the head with a large stick not to the story itself. Again the author proves a master at evoking strong emotional reactions to his characters, and pushing them to find the limits of their abilities. And he deals with “big questions” that interest me; e.g., the corruption of power, the use of violence, how the seeds of future despite are sown by present triumphs, and how – in light of that – can one act at all. I also think that one of the reasons Linden pisses people off so much is that she’s so much like us; she’s not the perhaps-initially-doubtful-but-soon-confident heroine we’d like (and expect) to see. Consider, you wake up one day to find yourself in the Land (or some similar situation) and are told that you have the power to destroy or to save the world depending upon the choices you make. Would you confidently stride forward to wield the Staff of Law or your white-gold ring against Fangthane and obliterate all who stood in your way? Wouldn’t you be terrified and constantly questioning yourself? Wouldn’t you doubt the reality of your situation and do everything you could to pass the responsibility to someone else? I’ll tap my fingers impatiently and grumble about publishing schedules incessantly but I’ll look forward to the release of the final volume - The Last Dark.